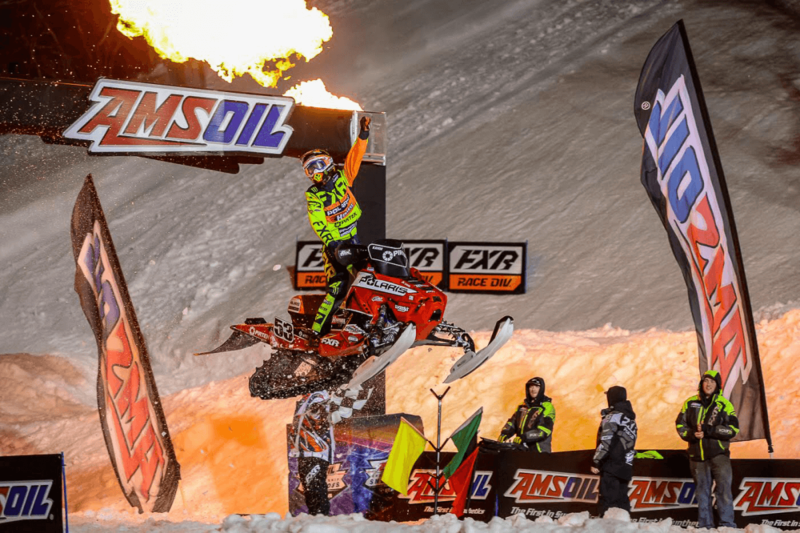 AMSOIL Championship Snocross, POWERED by RAM will use three days of racing at its annual finale in Lake Geneva, Wis. to crown a host of national champions. If night one is any indication, winning and losing the title will come down to smart racing, and whole lot of good fortune. 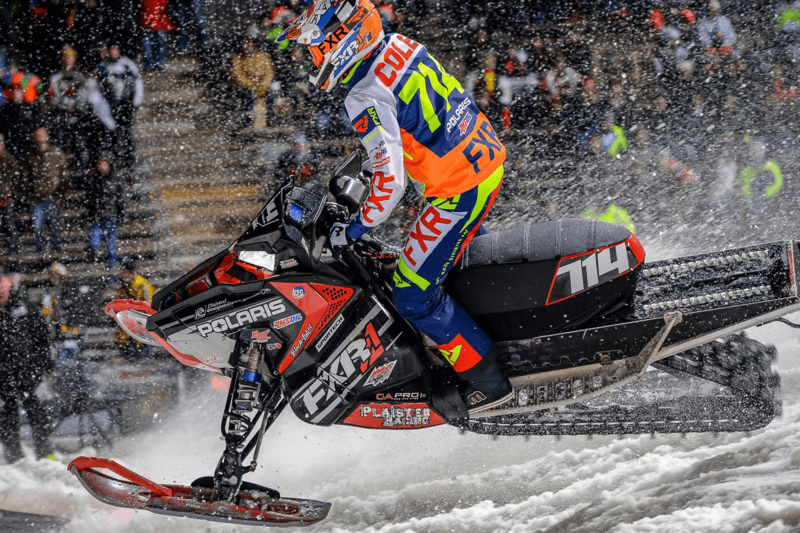 Polaris’ Kody Kamm could make a career out of racing in Lake Geneva. 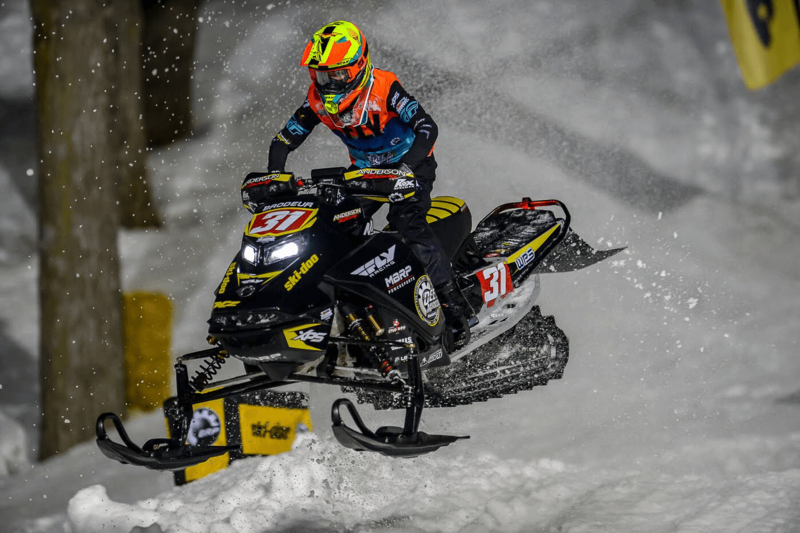 Maybe the proximity to his hometown of Kenosha, Wis. plays a large role, but every since Kamm won his first career pro race at the Grand Geneva Resort, he has found ways to win at the season-ender. As with the past few seasons, the pro class departs from tradition at “Geneva’. First is the three days of racing, which makes a champion earn it at the end, no matter what happened over the last three-plus months. Second is the strategic Joker Lane on Friday night, which each rider must take once or receive a penalty. On Friday, the Joker Lane was a major factor in the nights finishing order. 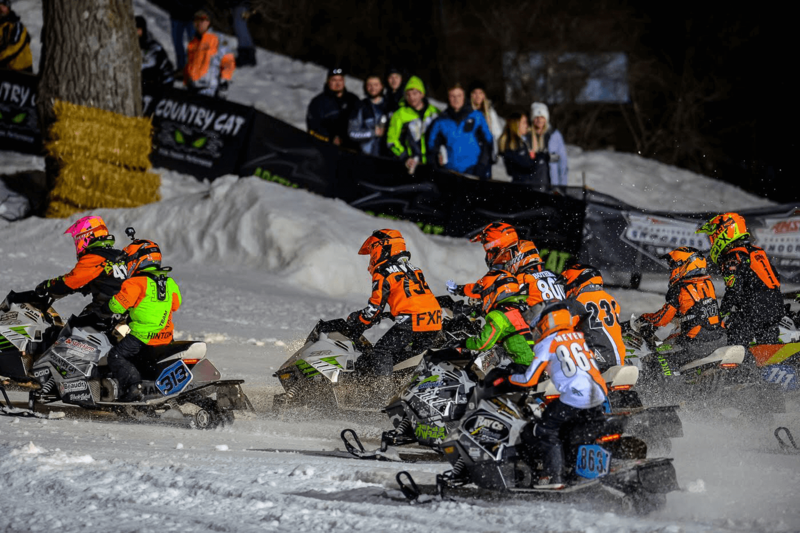 Arctic Cat’s Daniel Benham was looking to wrap up his rookie season with another win, and the young upstart ripped another great hole shot in the final. Benham paced the field for nine laps, with Kamm and points leader Elias Ishoel in tow. 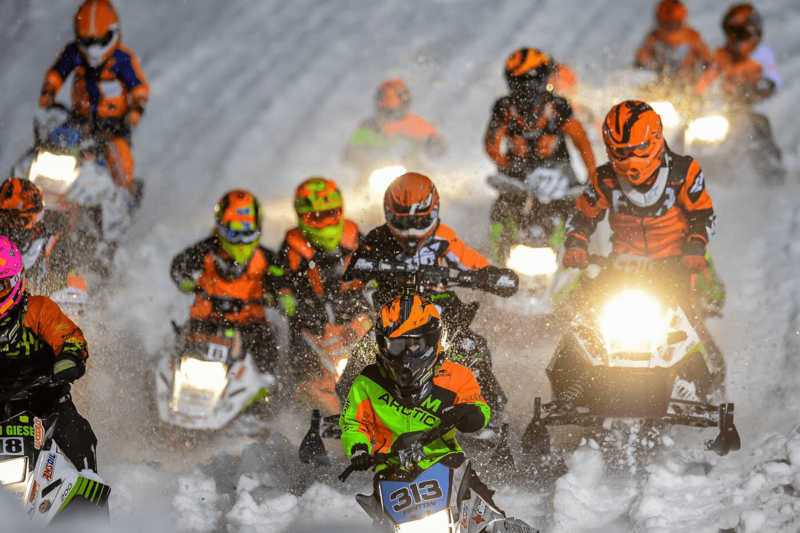 But the steep downhills at Geneva have been known to knock down race leaders in the past and Benham mistimed a descent, crashing his way out of the lead and his second win with just a lap-and-a-half to go. Benham’s mistake briefly turned the lead over to Ishoel, but Kamm countered and overtook Ishoel. Kamm looked poised to pick up the win, but both he and Ishoel had yet to take the mandatory Joker Lane. This years Joker Lane consisted of a third uphill pull just prior to the finish line turn. At this point, the Joker Lane had become worn down and icy, and both Kamm and Ishoel had to carefully navigate the extra trip up-and-down. Behind them, early race strategy by Adam Renheim had created an ideal end-of-race situation. 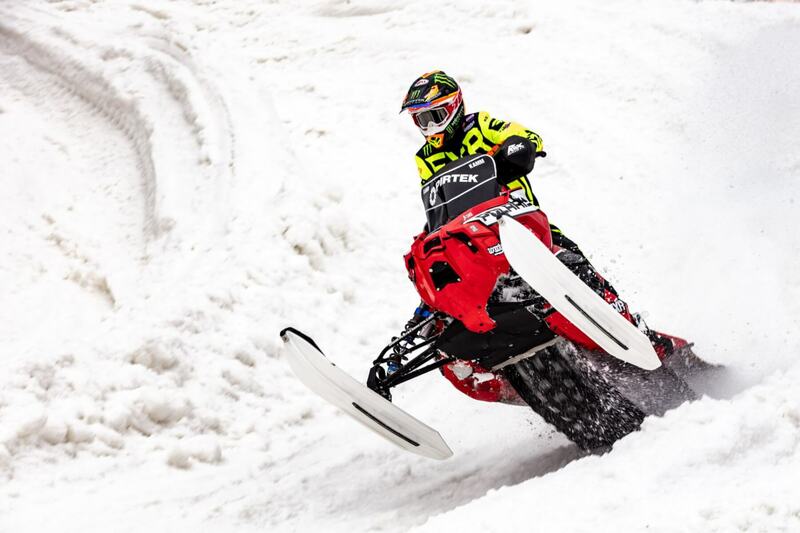 The Ski Doo racer had a terrible start, and decided to take the Joker Lane right away. As Renheim charged through the field from 14th, his timing put him in-between Kamm and Ishoel as the two exited the Joker Lane, with one turn left to set the podium. 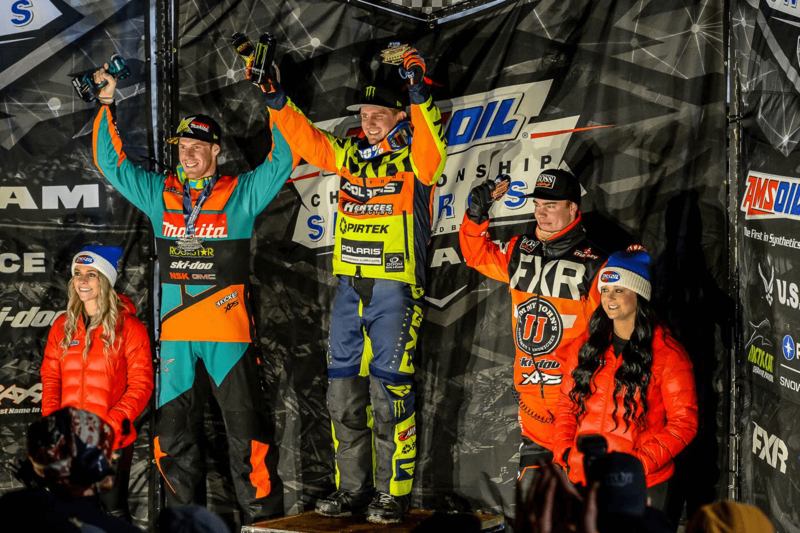 After a wild race, including an incident that saw Ishoel saw his helmet visor bump a low-hanging branch, Kamm sat atop the podium with a huge hometown party laid out in front of him. Kamms win was a good start to the weekend, but Ishoel had another great night in his quest for his first title. Ishoel had better heat race finishes than Kamm, and despite the gap in the final, actually extended his lead with two races left. Megegan Brodeur continued her spectacular season by winning the Pro Am Women’s final. Brodeur’s win was enough to grabbed the season championship over Taven Woodie. Zach Pattyn and Matt Pichner are neck-and-neck in the Pro Am Plus 30 points race, but it was Andy Lieders who stole the show on Friday night. 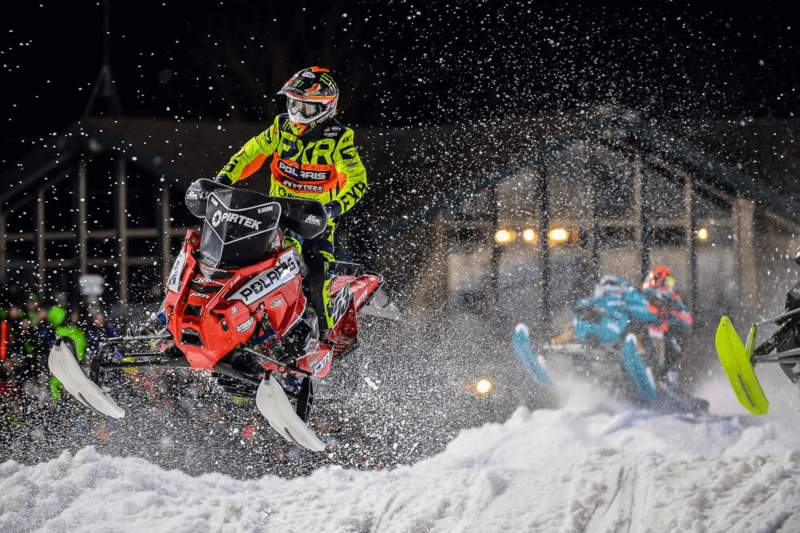 Lieders made a last second decision to race at Lake Geneva as his family deals with flood waters near his hometown of Colby, Wis.
Avery Hemmer doubled down by winning the 120 Champ and Pro 206 8-12 classes. Kellen Chapuran also double-dipped by winning the Jr 10-13 and Transition 11-13 classes. Chance Tietjen handled both of his races, winning Jr 16-17 and Jr 14-16. Taylor Cole held on for the win in the extremely competitive Regional Pr Lite race. Cole held of Danny Polecki after making the pass on the second-to-last lap.